This lovely carving was given to me when I resigned/retired from being the Administrative Assistant for our congregation Temple Beth El. I was amazed because no one on the Board at that time knew my personal prayer practice, which has involved this prayer for years and years. It was what I call a b’eshert moment. Beshert means “inevitable” or “preordained.” It can apply to any happening which appears to bear the fingerprints of divine providence, such as bumping into an old friend you were just thinking about. 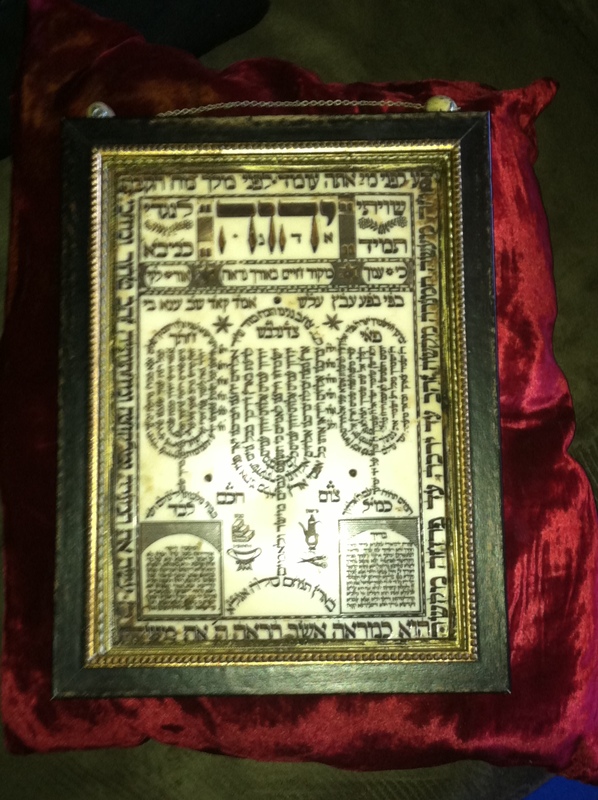 When you look at this picture you can see how complex Hebrew prayers and teachings really are. The Hebrew here is textured and layered. The four letters here that are largest are the ones we don’t ever say or even write down without being very careful. There is POWER in naming. Any tribal person will understand this as will all those who have ever named a child or a pet or a business. So, we don’t mess around when we are talking about the most HOLY name. Because we cannot ever really get our minds around the entirety of a Divine Being, we do something different. We use the word Ha-Shem which literally means The Name. This reflects the concept in Judaism that you cannot quantify or confine the Divine; unnameable, infinite and vast. Ha-Shem is not like my name or yours. Since the Divine cannot be quantified or qualified, we engage in various ways to describe or connect to the energy of the Divine. This stands in contrast to the idea of the Divine being split into various other beings or forms, but for me and for many others, there is no real contradiction. It doesn’t matter to me what you name or call your Holy Being, what matters is how you BEHAVE in this world and your adherence to goodness and to honoring those on the planet with us. If connecting to Isis or the River Spirits, Vishnu, Buddha, Jesus, Ha-Shem or any and all of the myriad ways Holiness unfolds and comes to each of us, makes you a better human and enables you to love those near you and this beautiful earth, then pray and sing and meditate and praise and delight in that Being or Beings anyway you can. As Jews, we adhere to the idea of b’tselem Adonai which can be interpreted to mean in the image of the Divine (and much, much more). The word Adonai is used here and is another placeholder word for describing a quality of the Divine. When you need a master or lord, someone who you can turn to to make things change. Many folks reject this idea of a Holy Being who is a lord and master. I know I struggled with it for years. I no longer do. I am so in awe of the Divine and so aware of how tiny I am, there is just no question that I am an agent of Holiness, but not the whole shebang. The BIG BANG or the BIG DIVINE BANG Energy is certainly greater than I am. A great book to read on this topic is God & the Big Bang by Daniel C. Matt. Adon in Hebrew can be translated as master or lord, so this name for the Holy One is engaged when we pray and are not using the four letter Tetragrammaton name like the letters above. The word Adonai is not that often written out in the Torah. Usually, folks say this word instead of reading the Hebrew four letter name. Please see further explanation of this in the Angel Song article. Additionally, b’tselem Adonai is an incredibly deep and complex concept, which I hope to expand on more in the future. I love the teaching by Rabbi Gershon Winkler that I heard many years ago from him. He was talking about how everything in our narrative was created before the human was. This is also accurate in terms of evolution. We are kind of last on the list. All the organisms and lava flows and acid rain and amoebas and creatures of myriad kinds unfolded before we did. Rabbi Gershon refers to this idea of b’tselem Adonai as having multiple layers and one of them is that we are in the image of the bear, the tortoise, the slug, the tree, the dolphin, the ladybug etc… Being able as humans to connect with more than who we are, and able to engage with all of creation and to be present with it is an amazing and unique gift. For myself as well, and for others, the flawed translation of Genesis 1:28 that says in English “conquer, subdue, vanquish or rule over” the earth is not only what the Hebrew means. It is our job to be in relationship with and look over and out for all that is on this planet. It is our job to connect with the frog and the mountain and to find ways to see Ha-Shem and ourselves in those. It is not our job to subdue them or violate them for our pleasures or purposes. Like animals, we need to nourish and sustain ourselves, have safety and home. We certainly have gone beyond our limits on that one. Returning to an idea of Holiness that is not nameable and that is complex for me is one way to connect to the energy of Holiness that runs through every blade of grass and every moment of my life. When I put boundaries on the sacred and limit it to one kind of parent or one kind of being, I am not in the flow that will empower and link me to ALL of creation and all of what I want to honor and love. So, all of this to say, I prefer to use the word Ha-Shem or the Holy One or any other myriad kinds of place holders, when referencing the Creator or the Energy of Creation. I don’t even want the words I use to insert a boundary on that which is beyond boundary, so I change it up. The word GOD is just too laden, heavy, connotes a bunch of things I may not mean or want to have associations linked to by what I am saying to folks. When I name or not name differently, that inserts a prompt in the mind and a reminder in mine, what is she talking about? That question is the beginning of a spark that ignites a flame of desire, and wonderment, or at least I hope it does. No, go and study some more! Hi Roz and anyone else. There are two CDs on Arik’s music page the second one is the simu lev one that had Angel song as track ten. The other cd Revive which also has simu lev on its title, since this is the name of arik and Maxine’s, group had track 10 being adon Olam. Hope this clarifies.